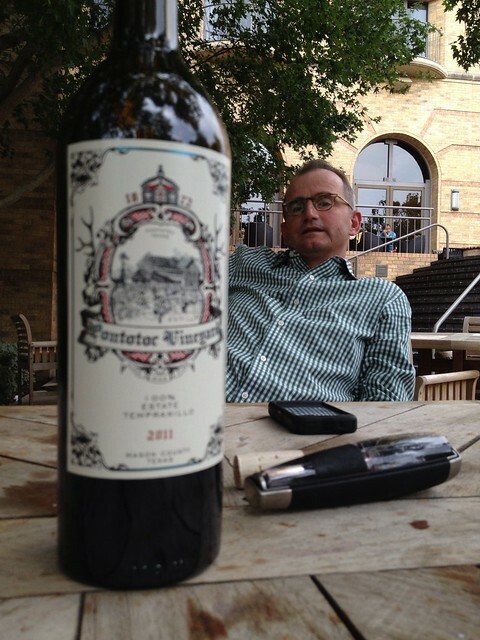 On the Patio with Don Pullum and Carl Money (Visual Tasting) | Texas Wine Geek™ - Drive. Taste. Talk. Write. Julie and I bumped into Don Pullum this evening after the last session today at TEXSOM and were invited to meet with Carl Money, the owner of Pontotoc Vineyard – who we mentioned in the May article about the new wine trail being kicked off this October. We had been eager to meet Carl, and when Don mentioned that we would also have the opportunity to get an early taste of the 2011 Tempranillo that will be debuted tomorrow at the Grand Tasting, our eagerness elevated to excitement. 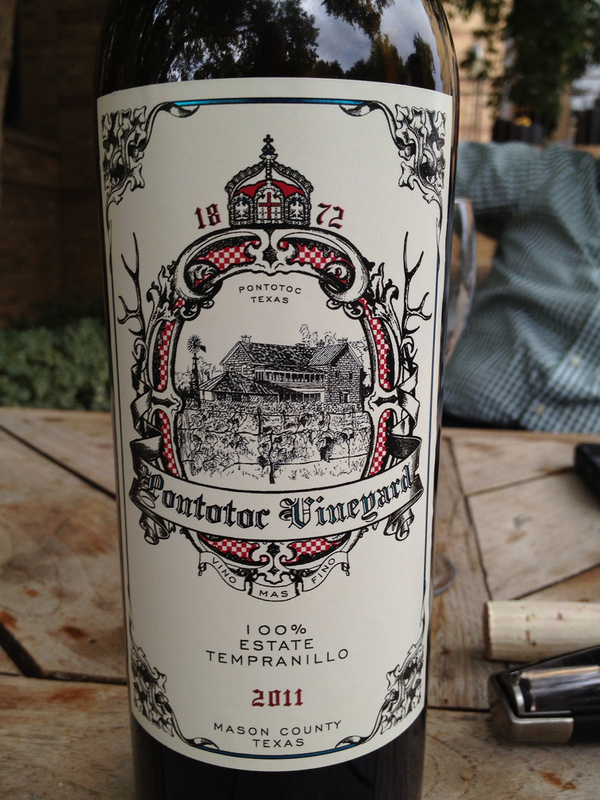 We barrel-tasted the Tempranillo when we visited Pontotoc last May, and it was already aging quite well. We met with Carl on the patio of the Four Seasons where he had already poured three glasses of Tempranillo. Julie will usually drink a little bit of red wines from my glass since she normally has difficulties with the tannins in bold red wines. I have to say that I was at a small disadvantage when I first attempted to pick up the nose of the wine – I had just finished a dry ’06 Riesling that had enough petrol to power a Volvo halfway to Houston. It took a good half hour for my olfactory senses to recover from the assault; however, it really was a good Riesling. 😉 I deferred to Julie to be my nose for the wine, and she was instantly captivated by “dark chocolate raspberry truffles.” Now THAT made me sorry I had the Riesling. 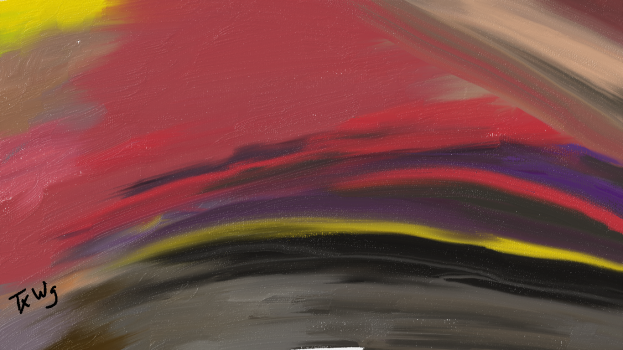 Of course, the cure for my nose was to wash the petrol from it by continuing to smell and taste the Tempranillo. Right? I can enjoy a good Texas Tempranillo, but I haven’t really had my socks knocked off by single variety Texas Temps. Some Temp blends have impressed me, but I still don’t think of Tempranillo as the grape that can or will change the Texas wine industry – at least single-handedly. The Pontotoc surprised me, though, by presenting enough fruit to please the “masses” who have come to expect fruit-forward red wines here, but also tannins that are definitely pronounced without being “scratchy”. Again, Julie confirmed my opinion of the tannins by accepting Carl’s offer of her own glass from which to enjoy the wine. Carl asked my opinion of the Tempranillo and whether I believed it was ready to be served at the TEXSOM Grand Tasting Monday evening and for general release in October, and I wholeheartedly expressed my affirmation. We also talked about how long it would last in the bottle and I had to pull all my mental notes and experience from Guy Stout’s wine tasting classes to venture an estimate, coming up with 4 to 5 years for it to peak with several good years to follow… and I quickly sought correction or confirmation from Don, who said that he was pretty sure the wine would show its best flavor in about four years. I would like to add that aspect to my reviews, if reasonable: an estimate on each wine’s “survivability” in the bottle; however, I’m not confident in my own skill to provide a credible estimate for you – yet. I’ll have to bring in guest tasters and poll them. I realized later in our conversation that Carl had quizzed me for my opinions to validate what he already knows and what Don had already told him. Carl and Don are both very pleased with the 2011 Tempranillo, but how will it be received by the wide backgrounds, palates, and tastes of the TEXSOM attendees – sommeliers responsible for catering to the tastes of their patrons, buyers who are looking for the next best-seller, and writers who will choose to praise, lambast, or simply ignore the wine. This writer will definitely NOT ignore – or lambast – Carl and Don’s first release of the 100% estate grown 2011 Tempranillo, and I urge all my fellow TEXSOM attendees to check out a wine that IMO expresses the Mason and Gillespie counties’ terroir (or DIRT as Guy Stout would say) so well. This entry was posted in Review, Texas, vineyard, Visual Tasting, Wine, winery and tagged Don Pullum, Pontotoc Vineyards, Tempranillo, TXWine, Visual Tasting, wine, winery by JCBaker. Bookmark the permalink. Pingback: Pontotoc Vineyard Tasting Hall and Winery - Press - Located just North of Fredericksburg, Texas, the winery will open to the public during Texas Wine Month, October, 2013.